The newly established DEKRA Award, organised by inspection organisation DEKRA and business news magazine WirtschaftsWoche, highlights a different topical issue each year in three focus categories. The award recognises the best sustainable solutions for future economic and social issues and rewards outstanding performances in the categories of “Health”, “Environment” and “Safety”. 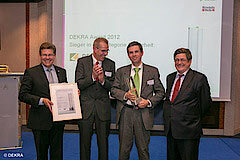 The DEKRA Award is run under the auspices of Germany’s Federal Ministry of Economics. These devices are used wherever a safe switchover to alternative power supplies (“emergency power supply”) is required, as in computer centres and hospitals. In the medical sector in particular, stringent demands are placed on the reliability of power supplies. These demands are set out in DIN VDE 0100-710 and IEC 60364-7-710 which specify power supply via two independent feed-ins and insulation monitoring of the non-earthed power supply (IT system) for operating theatres and intensive care units The compact ATICS® series of switchover and monitoring devices, which have been consistently developed in accordance with the functional safety specifications of IEC 61508 (SIL 2), is available to perform these tasks. The integration of the power circuitry and the electronics in a low-profile, compact device reduces the space requirement in the switchgear cabinet, minimises the wiring input and lowers the potential for faults. The patented switching technology in the power circuitry guarantees reliable switchover by means of mechanical and electrical interlocks and a high level of dynamic strength in the contacts. The insulation, load and temperature monitoring module monitors the IT system with precision and reports discrepancies at an early stage. ATICS® forwards process and alarm signals to signalling modules or control systems. All events are also written to a datalogger and are used for self-diagnosis.